No offense but have you been living under a rock? This is pretty common knowledge. USBC charging bricks with above 18W all charged the iPhone X at the same rate. This doesn’t mean that the iPhone X was actually drawing 18 Watts max. The X has a 10.9 WHr battery. It would only take about 60*0.5*10.9/18 = 18 minutes to charge a 10.9 WHr from 0% to 50%, but it doesn’t in the above chart. It takes 30 minutes. You can do the math to figure out the power drawn. 60*0.5*10.9/30 = 10.9 W.
The first 50% of a battery charge (really about 5% to 55% or so) is where power draw is at max and linear. So these basic WHr/W = Hr type computations will be close enough. So, a 10 W USBA charger that you can get for $10 is good bang for the buck for an iPhone. The new 18W will likely max out the power that an iPhone can draw, but the benefit over a 10 W charger, or the 12 W Apple charger, will be something like 5 to 10 minutes. The power meter was at 8.9V consistently for the first 50% of the charge, and Amps fluctuated between 1.0 to 1.8 or so. The screen cap here shows 1.19 amps. It averaged around 1.4 A imo. 8.9V x 1.4A = 12.5 W.
No one ever said it charges at 18w the whole time so you can’t just base your calculation on the battery’s capacity. The 12w charger doesn't charge at 12w the whole time either. Apple’s own claim is simply 50% in 30 minutes. But obviously the 18w charger is charging it faster than 12w. Just look at MacRumors chart. At 30 minutes the 12w charger is at 40 percent. The 18w is at 50%. Obviously it can take an 18w input, it peaks at nearly 18w in the video. If the phone didn't support it the charger would not be outputting at that rate. A 12w charger peaks at only 12w. Not to mention your whole claim was the maximum charge rate that the iPhones supported was 5.2a/2.4v. That was clearly wrong. iPhones don’t draw 18W and it doesn’t take 18 W input, at least not 2017 models or older. That’s clearly shown in the YouTube video that you linked. That’s clear from the data you linked. Yeah, maybe it doesn’t only use 5.2V x 2.4A, but it only draws 12.5W even when using 8.9V charging voltages. Since it only draws 12.5W, it means 10W chargers are the best bang for the buck, a 12W is even better if it can be found cheaply. Maybe 15 W charger is best if iPhones can take whatever they deliver. 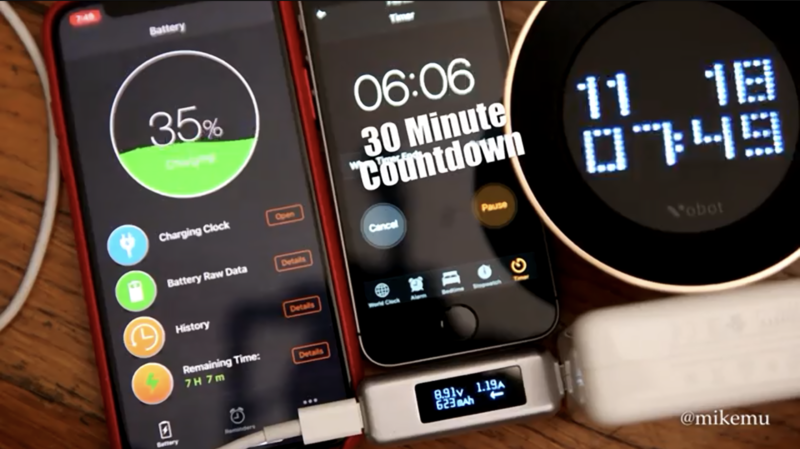 A person can buy an 18 W charger, or a 30 W charger, but they need to keep in mind that it is only buying them 10 minutes over 10 or 12 W chargers as iPhones can only draw 12.5 W. There is zero reason for anyone to buy chargers bigger than the 18 W one for iPhones. The 18 W charger is nice as it can max out what iPhones can draw, but people shouldn’t be thinking that it is going to be 2x faster than a 10W charger. Great for iPads though, assuming older models can draw that much power. It’s basically only 20% faster.